1. Prepare liquid dough: dilute 2 tsp of sugar in glass of water, add dry yeast and glass of flour, stir with fork or whisk till smooth consistency, cover with lid and let it ferment in a warm place for an hour and a half. Dough should rise and on it`s surface appear bubbles. 2. Add egg to dough, 2 tsp of salt, tbsp of olive oil, stir well, pour 2 gl of flour. Start to knead, gradually adding flour (about a glass), till dough becomes not sticky to hands. Knead dough well, to give it enough air, form ball from it and leave in closed bowl, in warm place for two hours. 3. Dough should increase in volume. Carefully divide it in portions and form bread. 4. If you want to prepare ciabatta with stuffing, at first form flat cakes from dough, then make rolls of them. Do not use rolling pin, do all gently with hands, dough should not be very thin and that`s ok if, it tears a bit. 5. You can use for stuffing olives, tomatoes, sweet and hot peppers. Cut vegetables into small pieces, remove pump from tomatoes and dry them with towel. 6. Before, you put it in the oven, let the ready breads stand covered with towel for 20 min. 7. It is baked for 40 min over medium heat. 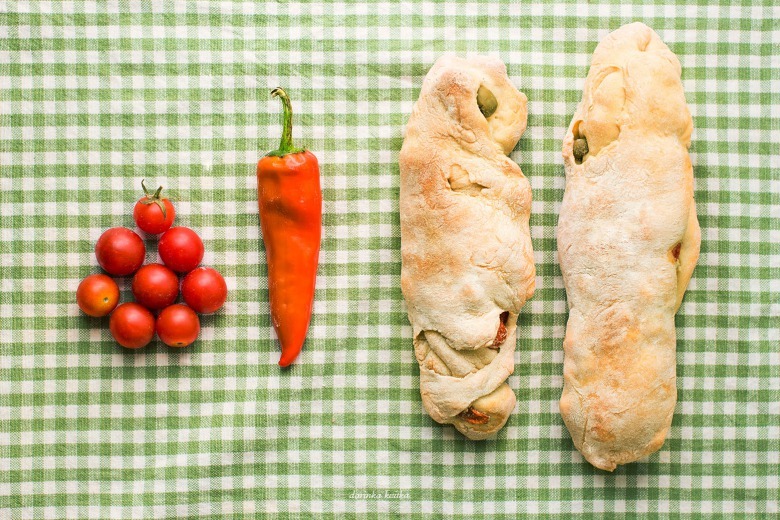 Top of recipe "Ciabatta with olives and tomatoes"